As I prepared to do my grocery shopping yesterday, I was focused on two things for last night’s meal: I wanted it to be fish or seafood, and I wanted it to use a recipe from my newest Maine cookbook, Good Maine Food (newest to me – it was first published in 1939, and subsequently updated – the most recent update being a new foreword by Sandra Oliver and recipe notes by Kenneth Roberts, published by Down East in 2010). This cookbook is truly an encyclopedia on traditional Maine food. In addition to Maine Home Cooking, it was a birthday gift from my mom and dad – you can thank them for keeping your weekly recipes stocked! 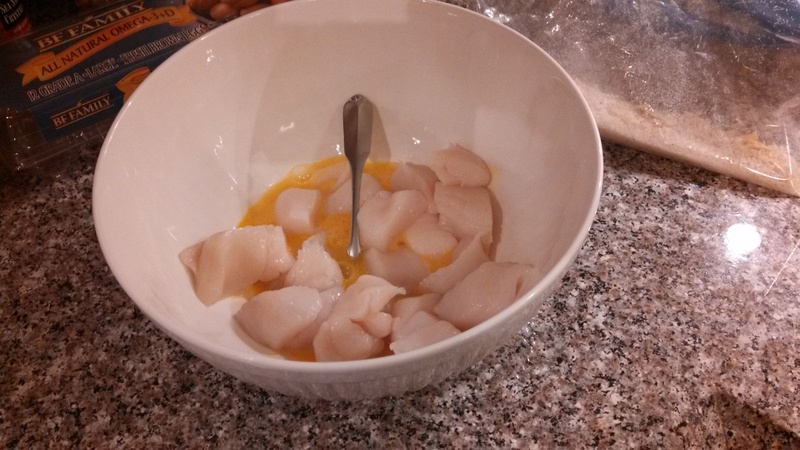 Wash scallops and pat dry. Dip scallops in beaten egg, and then in rolled cracker crumbs seasoned with salt and pepper. Coating with egg… this part was a little gross and slimy. 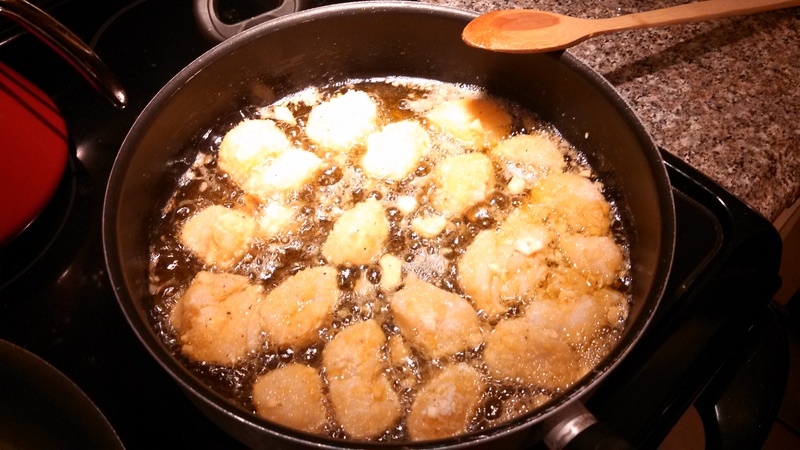 Fry in deep fat, 385 degrees, 2 minutes, and serve with either Tartare sauce or with half a lemon to each portion. This recipe serves 4. I cut the recipe in half, wanting only 2 servings, and as a side, I wilted some spinach. This would be perfect with a side of homemade fries. The wilted spinach was good (and healthy), it seemed out of place next to the fried seafood. The tasty (and pretty golden brown) results! A few lessons learned: the skillet I used was too large, so I had trouble getting the oil level high enough (I made it work, but it could have been better); I also think my temperature was too low, although not by much (the scallops took a bit longer than 2 minutes); and the batter could have stood a little bit more salt (my husband may disagree – he calls me the “seasoning queen” because I love to season – and sometimes overdo it!). Regardless, the end results were even better than I hoped. Nick and I both felt the flavor and texture of the scallops with the Panko breading was excellent, and this recipe will be used over and over again in our house. 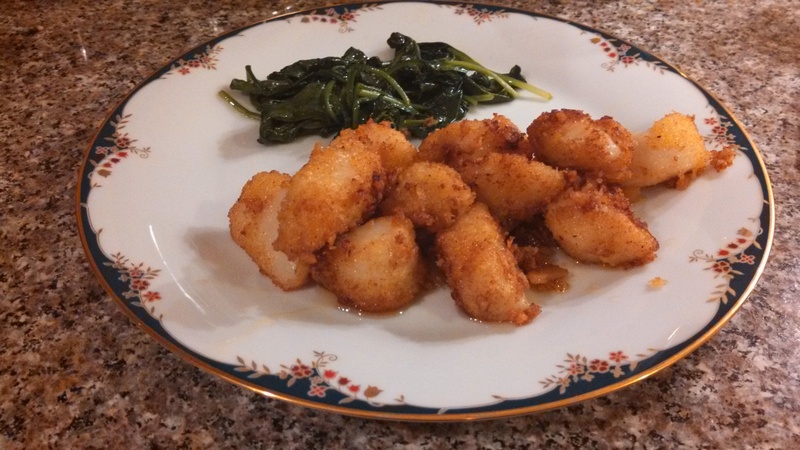 Categories: Drink, Eat, Weekly Recipe | Tags: fried scallops, Good Maine Food cookbook, Maine, recipe, scallops, seafood, wilted spinach | Permalink.